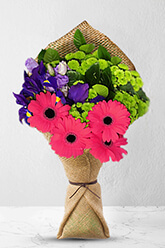 Shining, bright pink Gerberas incorporatedcreatively with blue irises, purple eustoma,and green button Chrysanthemum makesthis bouquet a seductive treat. Send Lipsy tosomeone you are longing to love.Vase not included however to betterpersonalise your gift, we recommend addinga Standard Vase to accompany this lovelycombination. The ordering process was quick, easy and simple, the delivery arrived very very promptly, and looked beautiful - exactly as expected. Thank you! I was kept well informed and even though it was a regional delivery it was delivered the next day. Thank you. It ment a lot for my nana too get the flowers.